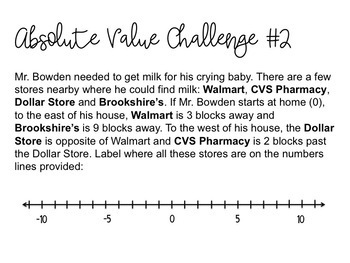 TEKS 6.2(B): TSW identify a number, its opposite, and its absolute value. The file consists of a PDF version of powerpoint presentation to be displayed, as well as two paper resources also included in PDF format. This file is zipped. Customer should research how to unzip a file BEFORE purchase. No refunds will be given for not being able to unzip the file. You may always contact me with any questions, or concerns via TPT site e-mail. 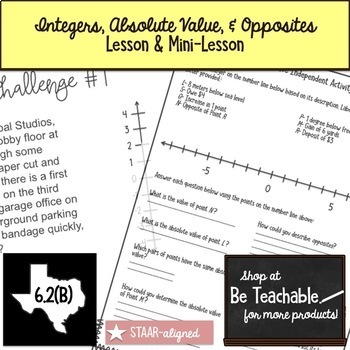 This lesson bundle includes two separate resources comprised to make one lesson for student discovery of absolute value and opposites. Students go through a series of challenges to discover the definitions of "absolute value" and "opposites", as well as challenges that put that knowledge into practice. Inside one resource are directions and materials for an integer identification mini-lesson. 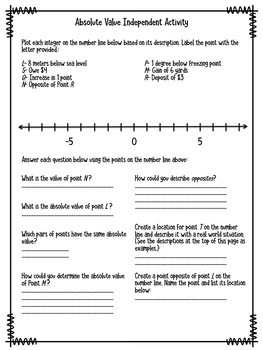 In this mini-lesson students use common real world integer phrases to match to an integer on the number line. There is also an independent activity included. This lesson is designed to promote high levels of engagement, student discovery, and student explanation of reasoning. 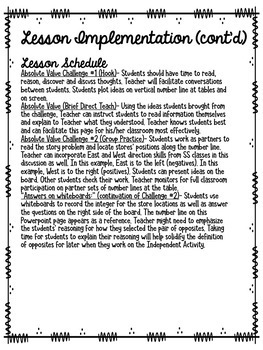 Students are given challenges to attempt to solve in pairs and discuss as large groups. Lesson Implementation is provided. Answer Key included. No time stamps are included in lesson implementation. Due to the learn by trial-and-error mentality, an hour would be the minimum amount of time needed for students to work through the mini-lesson and lesson.